© 2008-10 Poolboy Films. All Rights Reserved. ▪ The video that started it all, "American Adobo"
In Filipino, with optional English subtitles. Only NTSC Region '0' DVDs available. 1. Secure, fast and easy payments for your Poolboy Films products will be made using your MasterCard/Visa/AMEX/Discover debit or credit card via PayPal.com, the global leader in online payments. [You do not have to have a PayPal account to make a payment.] Just click on the appropriate "Buy Now" button, complete the forms and we'll be send your items to you right away. 2. Some browsers (i.e. Microsoft Internet Explorer, Mozilla Firefox) require a "Medium" setting in order to connect through to our "Buy Now" buttons at PayPal. If you are experiencing this, please go your browser: Tools - Internet Options - Security - Medium, then do try us again! Questions, comments, concerns? Send us an email. Our aprons are stain resistant, color-fast and have great washability. No ironing. No shrinkage. 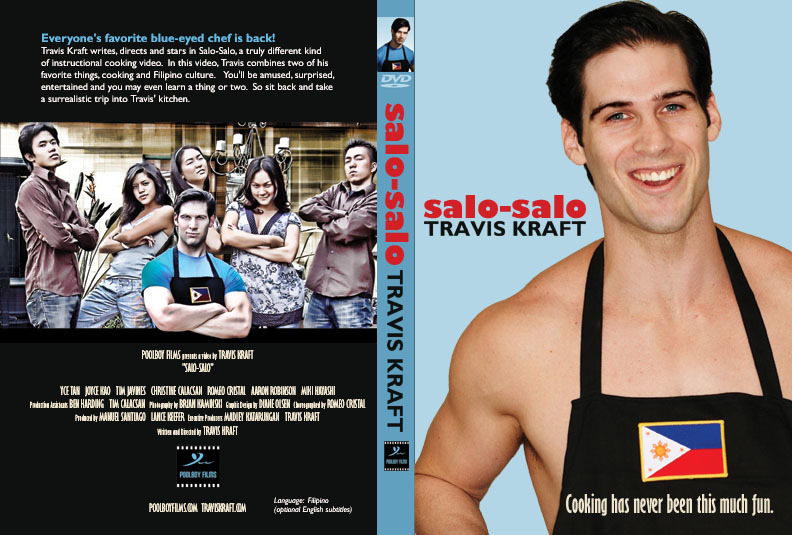 Apron Get an apron like the one Travis Kraft wears in "Salo-Salo"